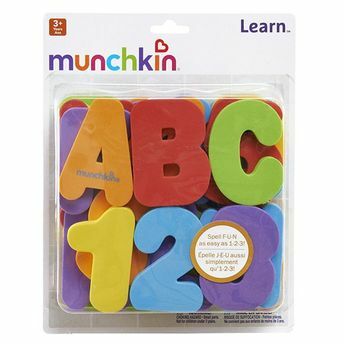 Munchkin Learn Bath Letters And Numbers comes in six fun colors, clings to bathroom walls when wet, and provides endless opportunity for bath time learning. You can help your child identify the alphabet, learn to count, spell simple words or group by color. An added bonus? The foam is soft, durable and non-toxic. So splish-splash, when they're taking a bath... throw in a little education, too.